Owing to our expertise, we are trading and supplying a wide assortment of Anaesthesia Vaporizer. Fabricated with utmost precision, this has a huge demand in the market. Due to its salient features such as sturdiness, corrosion resistance, high tensile strength, compact design and durability, this product is highly admired by clients. Available in various configurations and specifications in accordance with the details provided by clients, our offered product is strictly tested on various parameters by our vendors. Clients can avail this product at industry leading prices. The Pisces advanced anesthesia vaporizer from Meditec combines ergonomic design with consistently accurate and reliable performance. Available in a wide range of fittings and agents, the Pisces vaporizer offers maximum reliability with the minimum of fuss. 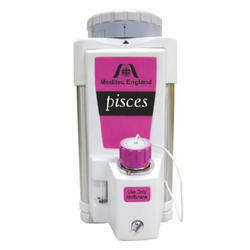 The Pisces vaporizer has been uniquely designed to be easily maintained. Each agent specific vaporizer signifies performance, convenience and ergonomic benefits with improved safety features to help improve agent delivery. Due to design improvements in the gas pathways, the Pisces vaporizer excels in output stability over a wide range of variables and can work in the most extreme conditions. Gives superb performance over a wide range of vapor concentration, temperature, particularly at low flows. A range of mounting systems makes it compatible with either Selectatec® back bars with interlock, Cagemount. The Meditec Pisces is a truly flexible vaporizer designed to be compatible with other manufacturers’ systems. 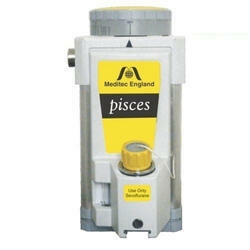 To minimize filling frequency, the Pisces vaporizer accommodates 250 ± 25 ml of anesthetic agent. All Pisces vaporizers are calibrated on a laser refractometer and are fully flow and temperature compensated to ensure output stability. Pisces vaporizers are precision engineered in the manufacture, fully tested and quality assured to comply with the most stringent of standards. 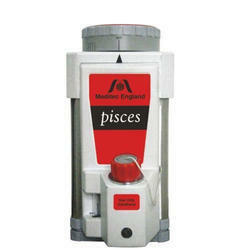 The Pisces vaporizer has been designed to be simple to use. It's ‘pull and turn’ dial allows single hand operation and enables the chosen output concentration to be easily read. All Pisces vaporizers are color coded, have clear agent-level indicators and a tamper proof label for complete security. Constructed from specially selected materials, the Pisces vaporizer is resistant to wear from anesthetic agents and the lack of moving parts within the vaporizer itself ensures that the product is extremely robust.